Years ago, I’d spend Thursday nights with BOTH of my grandmothers watching Verne Gagne, The Crusher and All-Star Wrestling. Go ahead. Try and explain it. No matter — the living room rumbles were rare. 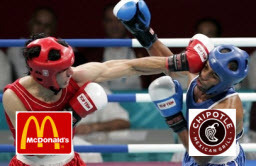 Tonight’s cage match includes McDonald’s (MCD) and Chipotle (CMG) … Panera Bread (PNRA) and Starbucks (SBUX) come over the top rope to keep things interesting. Yesterday, Benzinga’s Tim Parker posed the following question: McDonald’s (MCD) Had A Great Quarter — But Is Chipotle (CMG) A Better Buy? The article included references to Panera Bread (PNRA) and Starbucks (SBUX) … so I thought this could be an interesting opportunity to use some of the tools and resources at Manifest Investing to answer the question. It’s a fascinating matchup — the seasoned stalwart, veteran blue chip, McDonald’s (MCD) versus an up-and-comer that actually got its start in the McDonald’s training gym, Chipotle Mexican Grill (CMG). McDonald’s has the growth rate of a stalwart and CMG is “bringing it” expanding rapidly and showing promising execution. Operating results continue to be promising. As shown in the following dashboard, the comparison suggests that return forecasts for all four companies, including contenders Panera Bread (PNRA) and Starbucks (SBUX) is slightly greater than the average market return forecast of 7.3% (MIPAR, median projected annual return). Incidentally, only 59 companies (out of a 2400-stock population) have a quality rating of 84.3 or higher — so we’re dealing with four top shelf companies for this battle. As shown here, the Value Line low total return forecasts are a little more subdued, particularly for Panera Bread (PNRA). The average low total return forecast (for the overall market) is 7.9% — so again, MCD, CMG and SBUX are basically priced at levels slated to generate “market returns” going forward. A quick check of price-to-fair value (P/FV) ratios from Standard & Poor’s and Morningstar provides a couple more opinions. In this case, S&P doesn’t think any of the four companies are a bargain. (A price-to-fair value ratio less than 100% is a potentially undervalued stock.) In the current opinion of S&P, all four companies have P/FV ratios greater than 100%. Morningstar is a little more giddy over Starbucks (SBUX) but even Morningstar would probably like to see a P/FV ratio approaching 80% — to provide some margin of safety. It’s something of a split decision. All four companies are acceptable from a long-term perspective. The MANIFEST ranking is the combination of return forecast (PAR) and quality rating … and all four companies rank in the top 12% of all 2400 companies. All have excellent quality ratings and return forecasts at least slightly greater than the average return forecast. But we like buying opportunities with some upside. And in this case, at least for what could be the short term, Chipotle (CMG) gets a standing 8-count with a bearish overall trend. There’s no way to make that up on the judge’s scorecard until some momentum is restored. McDonald’s (MCD) is clearly what the crowd is chanting with a sentiment rank head-and-shoulders above the other three. Panera Bread is closest to being potentially oversold based on the relative strength index (RSI) approaching 30. McDonald’s is closer to overbought than oversold at 67.1. In the end, all four fundamentally-based MANIFEST rankings are fine — but we roll up our batch of technical indicators into the Fusion Rank (which also includes the aforementioned MANIFEST ranking) and we see that Panera Bread (PNRA) gets the overall nod — ranking in the top percentile (99) based on both fundamental and technical analysis.